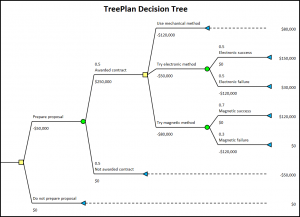 TreePlan helps you build a decision tree diagram in an Excel worksheet using dialog boxes. Decision trees are useful for analyzing sequential decision problems under uncertainty. 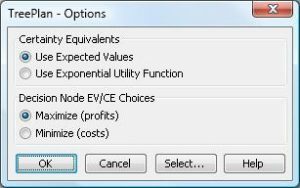 TreePlan creates formulas for summing cash flows to obtain outcome values and for calculating rollback values to determine optimal strategy. You can purchase TreePlan risk-free with our 30-day Money-Back Guarantee. 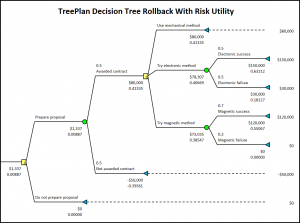 Save time by using TreePlan to quickly build a decision tree model. 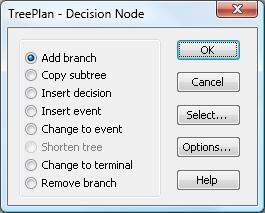 Two ways to run TreePlan: quick launch for temporary use, or permanent installation. Format your decision tree the way you want it. Use TreePlan to select a group of cells or shapes. Then apply Excel’s formatting commands to the group. Use TreePlan’s diagram to explain your analysis to colleagues. Check your assumptions. Perform what-if analysis using the Excel Data Table command to automate sensitivity analysis. 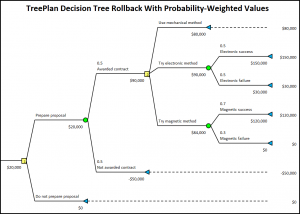 Integrate your decision tree model with other Excel models. see the optimal strategy from TreePlan’s results. For a larger version of a tree diagram, click the image.